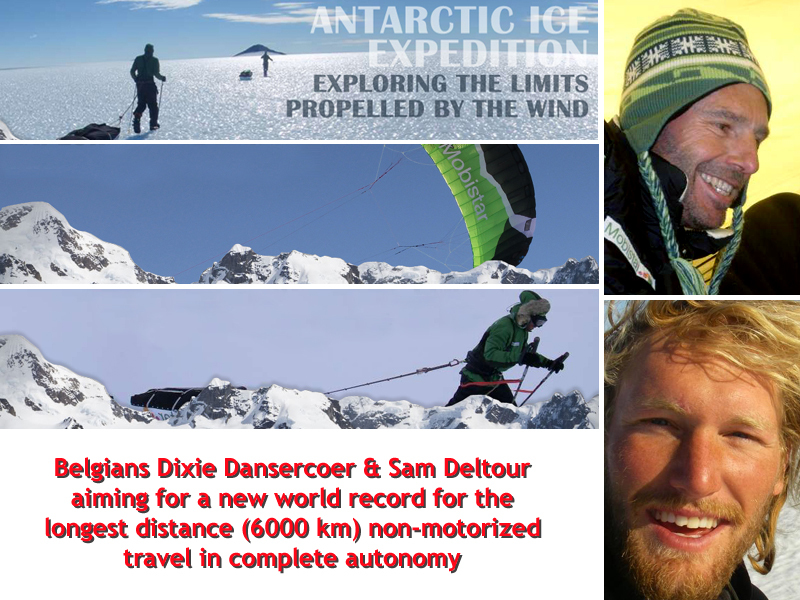 Belgians Dixie Dansercoer and Sam Deltour are aiming to try a new world record, going for a round Antarctica and anticlockwise voyage (non motorized and in complete autonomy) on a 6.000 km distance. Honouring the 100th anniversary of the race to the South Pole between Amundsen and Scott and the incredible perseverance of both explorers. Everyone who is interested by polar history remembers that Norwegian explorer Roald Amundsen reached the South Pole on 14 Dec 1911 by dogsled and skis and made the return journey in a total of 99 days and over a distance of 2993 km. While Robert Falcon Scott, on the other hand, having chosen poneys and heavy logistic to reach the South Pole, arrived a little over a month later, on 17 Jan 1912. The team of five perished on the way back, the last three members setting up their last camp not more than 20 km from the last depot. Raising the bar of sportive accomplishment of long haul Antarctic expeditions. Longest supported expedition so far is The International Trans Antarctic expedition from 1990, covering 3.741 miles (5.835 km) in 220 days. The longest unsupported expedition is 4.808 km in 90 days by Rune Gjeldnes. A scientific study of the catabatic winds in cooperation with a number of universities and meteorological institutes. Supporting Educational programs promoting environmental awareness. This expedition is set to leave the russian base of Novolazarevskaia in November 2011, and returning to the same base four months later, in February 2012.